The apartment is 80 sq m and consists of 2 bedrooms, a kitchen, a dining room, a living room, a bathroom and a toilet. There`s central heating system in all the spaces, and both bedrooms are air conditioned. One bedroom is equipped with a double king-size bed , a flat TV, and a walk-in closet, while the other has two single beds 90 cm wide, and one bed 120cm wide, a desk and a wardrobe. The living room is furnished with landscape queen sofas and an armchair. The unique design is here to provide the feeling of a warm and cosy home. The dining room is furnished with a dining table and chairs in original Austrian nut wood to bring warmth to your meals. You are free to use the Wi-Fi (70 Mbps) and a 42 channels cable TV (flat screen) as well as a fully equipped kitchen and a bathroom with a shower/bathtub. We offer fresh makena linen and bathroom towels, a hairdryer, and an iron. Organic BIO-Cosmetics from BioMedis offers a shower gel, a shampoo, and body milk. We offer a complementary use of the world class spa, just 80m from the apartment in a nereby hotel.. You can enjoy in the pool, the sauna and its gym. Very good experience. Eduard was most helpful. 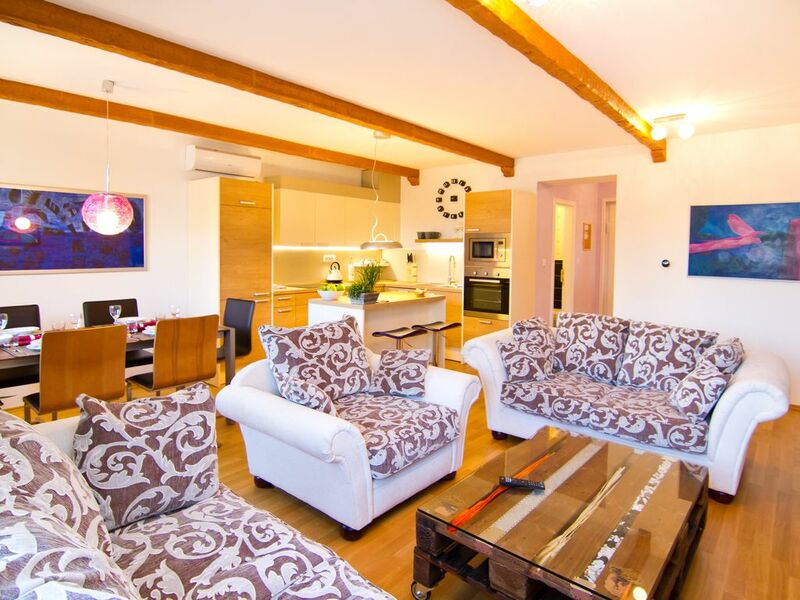 Building is older but newly refurbished apartment is contemporary and very comfortable. Neighborhood shops, major tram intersection, proximity to cultural venues and fine dining make the location unbeatable. Thank you, i was glad to accommodate you. Perfectamente equipado y diseñado. Apartamento tranquilo en una zona muy bien comunicada. The apartment is situated in the heart of Zagreb, 5 minutes walk from the main Ban Jelacic square, just next to the Croatian National theatre (HNK) and the A.T. Mimara Museum.